At San Diego Notary Now, we often face a dilemma where an appointment is all set and we come to realize that the name on the document that the client is required to sign and notarize does not match the name on their identification. Sometimes this is due to getting married, divorced, or the presence of a middle name that is not used on the identification. In this case, if the name on the document to be notarized is “John Michael Smith”, and the ID says “John Smith”, or if the document name is “Johnny Smith” and the ID states the signers name is “John Smith” we cannot notarize the document. A San Diego Notary Public’s job is to identify the signer accurately and to the best of their ability with satisfactory evidence. If evidence indicates that the signers name does not completely match the name on the document, it is ill advised for a notary to notarize this document. If the names don’t match, anybody with a similar or common name could get notarized as someone else and there would be a lot of fraud. 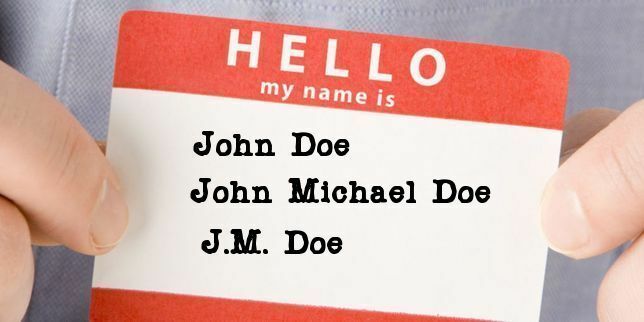 Most notaries go by the “id has more than the name in the document” as in John Michael Smith on the ID could get notarized as “John Smith” having left out their middle name is the course of drafting documents, etc. But vice versa is not allowed. There is the possibility of there being a lot of John Smith’s in San Diego County, and ensuring that the name matches the ID is a way to prevent impersonating. If you face a situation where your name does not match the name on the document, seek San Diego legal counsel for assistance in the matter, or contact the preparer of the documents (San Diego escrow company), etc. and advise them that your legal name does not match the document signer’s name. They may have a way to assist you in getting notarized or redrawing up the paperwork to be correct. If you use your middle name on documents, it is advisable to bring ID that matches this name, so if your valid unexpired passport has your middle name listed, present that to the Notary Public as your identification for getting notarized. Sometimes lenders use different documents such as a name affidavit when your legal name is different from the name on your id, so make sure to contact them with any issues you have getting notarized, and use your legal name whenever signing documents if your lawyer advises you to and to be able to get notarized with ease. When you are ready to be notarized as your proper legal name, call a San Diego county Notary Public.